It’s Thanksgiving weekend, and crazed consumerism is the top activity, both on Black Friday, Cyber Monday, and everywhere in between. Many shoppers are filling up physical shopping carts (hopefully avoiding a nasty elbow or two) and online shoppers are filling up digital shopping carts. Shopping carts (both physical and digital) will be an anachronism in just several years. In the near-distant future, goods will be delivered before we realize we want them, in a predictive manner. As we interact with products at physical showrooms or online, samples will arrive to our homes within hours, enabling us to try-and-buy, in a fremium model, that we’re already used to with online web services, like online photo sites, online storage, or email applications. Imagine liking a jacket on Facebook, Instagram, or Twitter a photo from your favorite clothing brand, or maybe you engaged with the product while at the actual physical showroom. The future marketing platforms will realize you’re a target customer, perhaps one that has purchased before, or that of a competitor, and you may have appear to be in the right geography, or indicate you’ve a job or cash. Within a few hours, the jacket would have arrived at your doorstep, before you realized that you really wanted to try it on. It would intuitively know your height, size and weight, providing the ideal fit. Perhaps if they didn’t know, multiple sizes of the same product would be sent to you. Automation enables this. Self-driving cars and trucks are emerging in just a few years, so the cost of the supply chain and home delivery will plummet, with less dependency on human labor costs. Also, it’s possible a drop box of clothes may have emerged in your garage that you granted commerce companies access to, or a drone may have air dropped it to your backyard. Of course, this won’t be for everyone, marketers will be sophisticated and vet out real shoppers from those that endlessly try on, without purchasing. Or perhaps you’ve already signed up for a subscription model at Trunk Club, Amazon Prime, or Stitch Fix. This model will even be cost-effective for consumable items too, your smart fridge, and smart kitchen will know what you want, before you do, and appropriate products will be delivered to your house, or your self-driving car will automatically pick them up while you’re sleeping or at work. The business model: For products that are un-wanted, the same courier systems would pick them up, return them to the warehouse, replacing stock. For some items, there may be some loss from damage, spoil, or loss. This margin will easily be offset by the opportunity to get products into customers hands, before competitors do, solving a need before customers realize they needed it. So there’s a glimpse into the future, marketing systems will be so intelligent, they’ll be able to predict what we want, and a whole host of products will be shipped to you. Imagine, all your Christmas presents come pre-wrapped and with holiday cards, event anticipating what your friends will want, based on social graph analysis. If this topic interests you, I recently gave a similar speech at TED, where I made predictions that cars will become “alive” as they’ll predict what we want, and need. Drone swarm. Image from the Internet of Things Institute. Drones aren’t just for sci-fi stories anymore. They have practical applications for the military, enterprise businesses, and consumers, and are gaining ever more traction with all segments. But this shift has much broader implications. In each post, all Kaleido Insights analysts conduct a joint analysis session around one topic (e.g. technology, event, announcement, etc.). 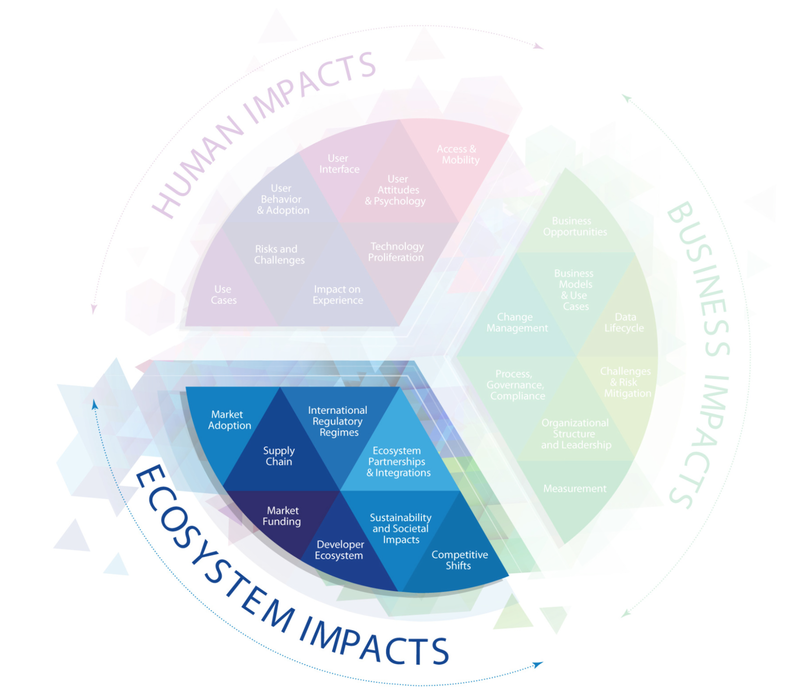 In this post, we analyze the ecosystem impacts of drones. The three main segments that currently use drones are the government, enterprise businesses, and consumers. Each segment has adopted the technology at different speeds and for different reasons. With the government, the military is an early government adopter of drone technology, and is primarily associated with two types of drones: unmanned aerial vehicles (UAVs) and swarms. Enterprise businesses have been slow to adopt drones, but there is an uptick in their adoption rates. Companies like Amazon are filing patents on drones, and industries including agriculture, real estate, and health supplies are using drone technology to operate more efficiently. Even Domino’s Pizza generated buzz last year for delivering a pizza by drone. Drones are also becoming increasingly attractive to end-consumers, mainly hobbyists, due to drone prices dropping and their availability in smaller sizes. While the drone market is growing, it’s difficult to quantify the growth rate for a couple of reasons. One factor is because there isn’t a consensus on how to define a drone. According to research conducted by Gartner, drone unit sales grew an estimated 60 percent to 2.2 million last year, with revenue increasing 36 percent to $4.5 billion. Data put out by the Consumer Technology Association suggests that hobbyist drones doubled in sales in the U.S. from 1.1 million sold in 2015 to 2.4 million in 2016. Drone technology is displacing current operational models across sectors. In the mail and package delivery industry, companies like UPS and DHL are confronted with the possibility that drones may do the work of their drivers. Taxi cabs and ride-sharing services are being manned by autonomous cars. Google’s Project Loon is delivering Wi-Fi through balloons. Image sources: Mercedes Benz, Business Insider. But the market is responding to these shifts. One example is with Mercedes Benz, which developed a concept of a self-driving van that also acts as a hub and charging station for drones that can deliver goods. Another example is with advertising. Intel used out-of-home (OOH) advertising to spell INTEL with 500 drones at the Super Bowl. Advertising agencies like DroneCast and Hoovy offer “drone-vertising” services. And a Singapore advertising agencyran a test that used drones for hyper-local data collection through public Wi-Fi signals to target customers with contextually relevant, localized ads. Use cases for this type of data collection include surveillance, payload delivery, and military. In addition to advertising, drones are even being used by professional and hobby photographers to capture aerial views. Drones have the potential to offer significant advantages for supply chains. They can offer last-mile and same-day deliveries, helping foster a positive customer experience due to speedy deliveries. Drone fleets can also be used to track warehouse inventory using RFID tags, helping to track and reduce the number of lost supplies. The U.S. Army lost track of $5.8 billion of supplies in its warehouses between 2003 and 2011 and in 2015, the U.S. National Retail Federation reported losing track of an average of $45.2 billion of items annually. The practical applications of drones are driving companies to enter industries and create partnerships that may not have been perceived as a natural fit in the pre-drone era. In 2016, Zipline entered the medical arena by partnering with the Rwandan government to deliver medical supplies via drones. An early commercial test cut the amount of time for a medical facility to obtain blood from four hours to 15 minutes. After success in Rwanda, Zipline is now partnering with the Tanzanian government to offer similar, life-saving services beginning in 2018. But the partnership doesn’t end there. Now UPS is working with Zipline and the Gavi-Alliance to provide logistics expertise to help Zipline deliver medical supplies in remote areas. Drone technology is also being developed by e-commerce giants. Companies like Amazon are developing drones to safely deliver packages to customers in 30 minutes or less. China’s second largest e-commerce company, JD.com, is developing a drone that can deliver loads weighing one ton or more. In order for this technology to be fully realized, drones will need to be autonomous, moving safely on their own. Companies are already working on this problem. Microsoft, for example, created open source software, available on GitHub, to train drones and self-driving cars on real-world conditions, including shadows and reflections. Related to safety, Amazon is asking the government to designate special airspace for them to fly their drones at an altitude that separates it from commercial and military flights. Qualcomm is testing drone technology at their FAA-authorized UAS Flight Center. This is a test environment that replicates real time conditions in commercial, residential, rural and FAA controlled airspace. In Denmark, the International Test Center & Clusterincludes dedicated airspace nearing 540 square miles that covers land and sea. Drones also have the ability to collect information at the ‘big data’ level by capturing images of homes and landscapes, which can then be used in innovative ways. Technology patented by Amazon would allow the company to scan and collect data from the houses their drones pass, which could then be used to let customers know if they have a damaged roof or sick trees. And companies like Skycatch use drones to survey property and turn the data into maps and 3D models. Aerial drones also have implications for defensive measures. They can monitor the landscape for security and safety in terms of border control, police activity, customs, civilian protection, natural disasters, and environmental protection. Moreover, a counter-drone industry has emerged with about 70 companies working on the goal of disabling or shooting down other drones. Open source drone projects are now a major method for developing drones for a number of reasons, including the ability to rapidly develop features and functionality, the cost-effectiveness, and their ability to provide a community where bugs can be resolved quickly. DroneCode Project, owned by the Linux Foundation, is one of the main players in the open source realm. But private companies have their own open source ecosystems, too, like Microsoft(mentioned earlier in this article) and DJI. One key area that developers and researchers will need to address is in creating autonomous drones, ones that know where they are, what is is in their path, and can then use this information to move safely and correctly. This technology, called Simultaneous Localization and Mapping (SLAM) is being addressed by companies like Exyn Technologies and Parrot. In conjunction with SLAM, drones will need to be able to communicate with one another so they don’t collide. Qualcomm is testing 5G cellular technology for this purpose. While drones offer the potential for a multitude of benefits, they also encompass drawbacks. A large issue revolves around privacy, with concerns that sensitive information or geographic areas may be captured from aerial drones and shared with unwanted parties, or that people may be spied on with facial recognition software. Physical safety is another area to consider when drones are used near airports. Drones also have an impact on the environment in terms of noise pollution. A preliminary study from NASA indicates that a drone’s buzzing is perceived to be more annoying to people than automobile noises, even when the volume is held constant. This confirms the demand for quieter drones which are now entering the market. There are several corporate funders on the drone scene, with the big ones being Lux Capital, Qualcomm Ventures, Andreessen Horowitz, and Felicis Ventures. As of March of this year, the Wall Street Journal reported that venture capitalists already invested $200 million on the global drone market. Some of this money is being funneled into services that track and deter drones that are being used for negative purposes. Droneshield is an example of a company that provides drone deterring services. There is also an opportunity for drones to receive funding for sports and entertainment. Amateur drone racing through the Drone Racing League (DRL) raised $20 million in Series B funding from Allianz, Sky, Liberty Media Corporation (owner of Formula 1 racing brand) and Lux Capital. More than 75 million fans watched DRL races, either online or on TV through networks like ESPN. With the rapid pace of drone technology advancements and more end-consumers using the technology, some governments are requiring drone registration and others are partnering with the private sector to use drones effectively. In the U.S., the FAA has the “line of sight rule,” which requires drone operators to keep unmanned aircrafts within their line of sight at all times, along with rules for pilot certification in instances where drones weigh more than .55 pounds. Many states also enacted their own laws to protect privacy and prevent interference with hunting. The Portuguese government is planning to introduce “free zones” where drone technology can be developed and tested more easily through special regulations and investment incentives. And, Amazon is partnering with the UK Civil Aviation Authority to test drones for Prime Air delivery service, which goes beyond line of sight in rural and suburban areas. Like mobile phones, drones offer a growing ecosystem and are following the smartphone app/developer model. But, before the drone industry can realize its potential, it faces a few barriers it needs to address. First, drone data needs to be able to integrate within a network and drones must be able to coordinate with one another (drone to drone communication). Then, there are the physical limitations: sun/weather/wind/battery. And finally, drones set up many legal and regulatory issues because the technology will move faster than regulators can move, meaning the drone space will continue to be wild west.